We sailed into Bahia Cumberland, Isla Robinson Crusoe as the Sun went down on Tuesday 16th February. We were trying to decide where to anchor in the deep and poorly protected waters of the bay when the Juan Fernandez Radio called us on the vhf. They asked the usual questions and directed us to an area reserved for yachts and suggest that we could pick up one of the buoys there. We decided to take the buoy as the riser looked new and in good condition. Everything was hooked up in the final gloaming of the day. It was beer o’clock. The last few days of sailing towards Isla Robinson Crusoe had seen fair weather and we had averaged about 130 miles a day. Paula had got her sea legs and the galley was in operation again. It has been cold and occasionally misty but never really miserable; cold enough that we were glad to be able to close the dodger door and keep watch from inside at night. The previous couple of day’s sailing had been all downwind, apart from the last 10 miles in the Bay, with the breeze varying between 15 and 30 knots. All the steering was done by the Aries wind vane. After a leisurely Wednesday morning we headed ashore to do the paperwork with the Armada where a man from SAG (Agricultural bio-security chap) also turned up to check our papers. He wanted to know if we still had any fresh food aboard from the time of our arrival in Chile; he seemed satisfied when we told him we had eaten it all as we had arrived in Chile over one year ago. The town is called San Juan Bautista with a population of about 1000 these days and our next call was at the tourist information office; Yes there is one. We were surprised at the level of tourism on the island. There are not hundreds of tourists but they and the small industry to support them is very evident. There are a few flights a week in a small landing strip at the south west end of the island where there is relatively flat spot. The aircraft are small 8 to 12 passengers. There is no road from the airfield to the town so after landing the tourist if faced with a 15km walk or a 1-hour boat ride. The only other access to the island is as a passenger on the small supply ship that seems to run when required bringing in supplies for the community and taking out the catch of spiny lobster (Jasus frontalis) to the mainland markets. Historically the most famous resident of Isla Robinson Crusoe was Alexander Selkirk who was marooned here for four years and four months from 1704 until 12th February 1709. 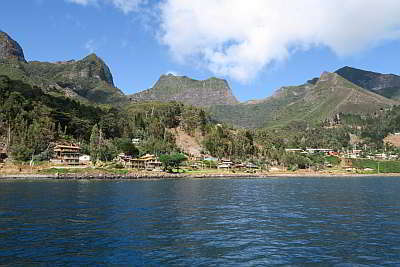 His story is said to have inspired Defoe’s famous book Robinson Crusoe and the Chilean Government renamed this island to Isla Robinson Crusoe in a effort to boost tourism. We made the trek up to the place where he kept a lookout and a signal fire burning every clear day for all those long years. Halfway down the trail in a hidden side valley are the ruins of the house he built. There are stone walls almost a metre thick today standing about 1.2m high. The walls were bound with a clay mortar and it looked quite substantial. The island has been permanently inhabited since 1749 when Spain built a fort there to help protect its kingdoms from pirates and privateers. Some of the walls of the fort and few rusty cannons are still visible. There are various other more modern fortifications from both world wars including a few large 152mm guns in the centre of the town. The island saw some brief action in March 1915 when the British finally cornered the German cruiser SMS Dresden in Bahia Cumberland and opened fire on her briefly before the German commander ordered her to be scuttled. At least one of the German sailors made the island his home; his house being a stop on the tourist trail. There is small memorial to a few of the crew of the Dresden in the little forlorn cemetery down by the beach. A row of more recent graves along the back fence bearing witness to the Tsunami of 27th February 2010 that hit the island in the early hours of the morning killing 16 people 10 of whom were washed out to see and their bodies never recovered. Several of the victims were children and the oldest a man of 94. The island is a UNESCO world biosphere reserve. 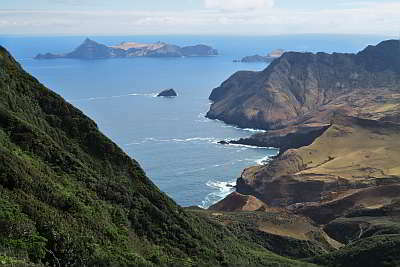 Around half of the plants on the island were endemic as are several species of bird. We had seen the white bellied storm petrels around Morgane for the last couple of days of the voyage. They have a peculiar flight pattern that includes dragging one foot in the water. One day we visited CONAFs (Corporation Nacional Forestal) headquarters where they are running a multi-faceted project aimed at controlling the invasive species, re-establishing the local flora and preventing the extinction of some species. The main invaders being the usual culprits: rats, rabbits, goats, cats and humans too I suppose. The flora has been heavily modified by the introduction of several trees; again these are usual culprits planted by the early seaborne explorers: pines, and eucalyptus. A lady called Karen showed us around the greenhouses where they are working to cultivate the endemic species and reintroduce them to the wild after clearing areas of introduced species. She told us that there have also been intensive campaigns to eliminate the goats from the island and these days there are just a few in very remote parts of the island. They are attempting to sterilize the cat population in an effort to protect the endemic humming birds. Fairly rich waters surround the islands of the archipelago and spiny lobster is a major catch. The lobsters a caught in pots from open boats that were until recently all wooden, carvel built, double enders about 8 to 10m long resembling whale boats. They have all been modified to carry an outboard motor in a well and are no longer rowed. 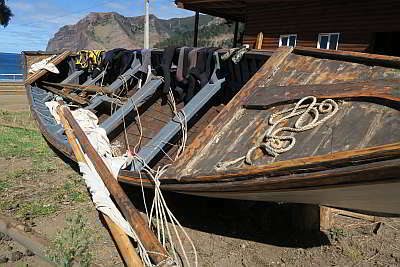 The wooden boats are rapidly being retired in favour of GRP skiffs. A few years ago four or five men took the last traditional boat built on the island and sailed it to Valpariso, nobody mentioned sailing it back so I guess it came back on the deck of the supply ship. That’s a brief snapshot of Isla Robinson Crusoe as we found it. Tomorrow we’ll leave for a longer hop over to another island of legends; Easter Island. Hi Chris ! Very interesting, thanks !